1950s: horse drawn carriages, men and women jam London street in 1901. portrait of Queen Victoria of Great Britain. 4k00:221940s: Factory. Trains in railroad yard. Cars on assembly lines, ships at port. Cards with monetary amounts on them. Shelves full of canned goods. House. Man walks down the street, into building. hd01:24CIRCA 1950s - An introduction to the campus and surrounding region of Cedar Crest College, in 1954.
hd00:211950s: Group of boys play in street. Boy joins game. Woman and girl walk into building. hd01:17CIRCA - 1943 - Nazi soldiers surrender to the British in Tunis, Tunisia during WWII. 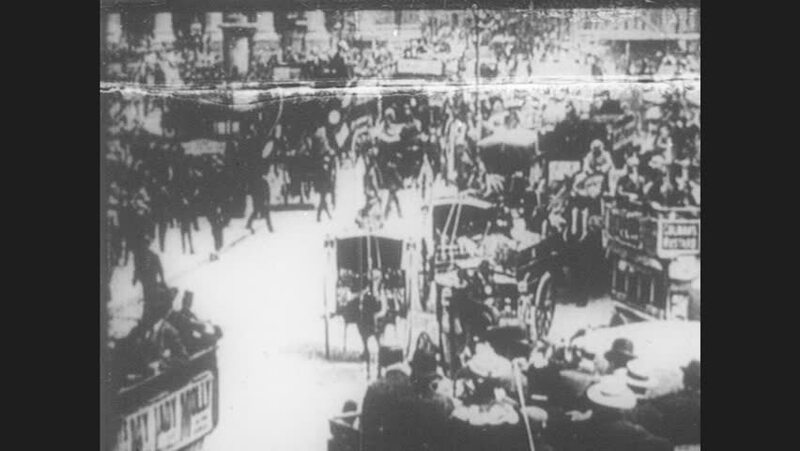 hd01:07CIRCA 1918 - Sailors of the US Navy march through Times Square. hd01:42CIRCA 1944 - Swarms of French citizens follow General de Gaulle as he visits the tomb of the Unknown French soldier, then follow him to Notre Dame.